Posted on August 23, 2010	by Linda S.
This is Donna. We had about an hour with only the two of us, so Donna chose to use 10 cards and do a 10 card 4F-4B design. She was amazingly quick at picking up the process. This is Kathy. Since we had a little less time to work with, Kathy chose to do a 4 card all forward design. Another quick study, she picked up the process quickly. These are working out wonderfully. The fabric strip warps are wide enough that they hold the weft really well and the whole thing is wonderfully squishy underfoot. These weaving sticks are larger than usual. I made them from 3/4 in. poplar dowels that were cut into 6 1/4 ” ( 16 cm) lengths. One end is rounded on the belt sander and the other end is flattened on the round vertical sander (on both sides) until the dowel is left approx 1/4″ thick. I then drilled a 3/8″ hole in the flattened end. I have made many sets of these weaving sticks in several different sizes, but these seem to be the perfect size for using with cloth. 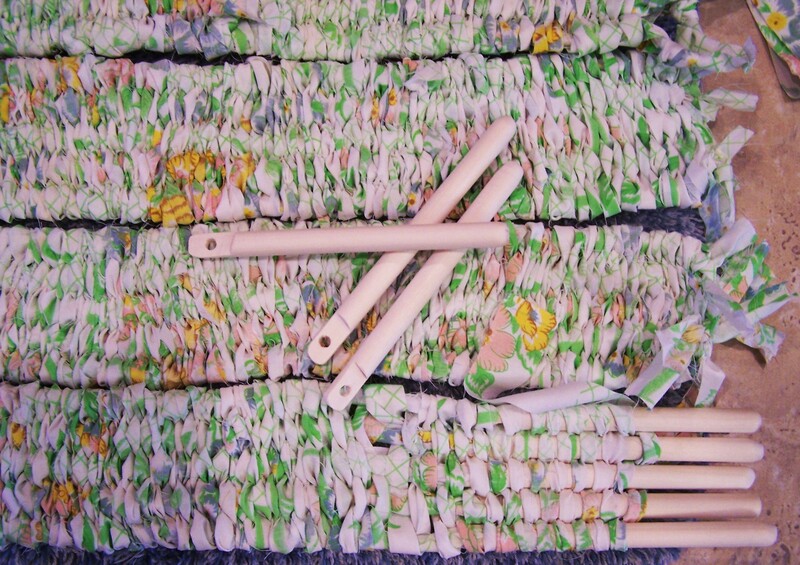 I have been working on a tutorial for using these weaving sticks to make a rug. When this is finished, I will post a pic and put the tute up also.. This entry was posted in Card Weaving, Handcraft, Handwork, Historical Textile, Tablet Weaving, Weaving. Bookmark the permalink. Hi! I found your blog while searching for “Tablet Weaving Looms”. 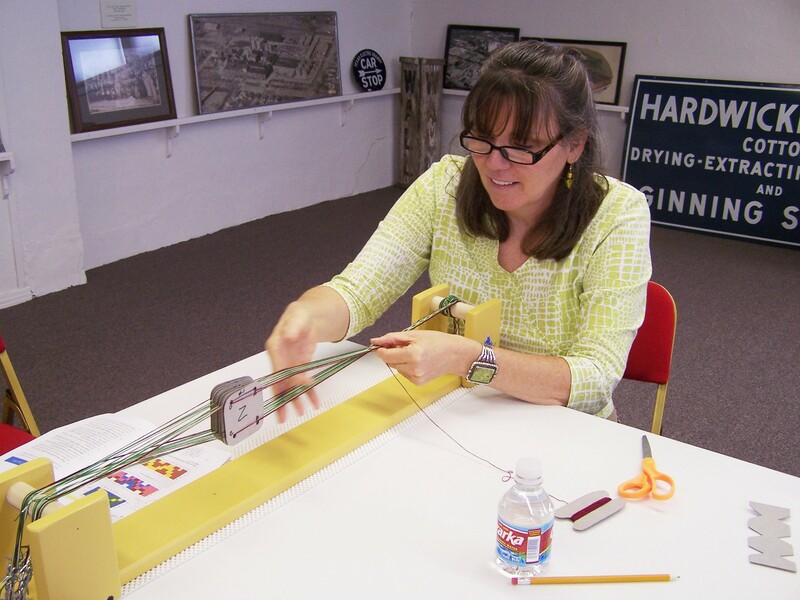 I’m interested to find out details about the looms your class was using–brand, where I can get one, and so on. If it was handmade, maybe the plans are available? Thanks in advance for any advice you can give. I’m just learning to card weave and I’m sure I’d be happier with a portable set up like this, as opposed to strapping myself to a C-clamp like I’ve been doing. 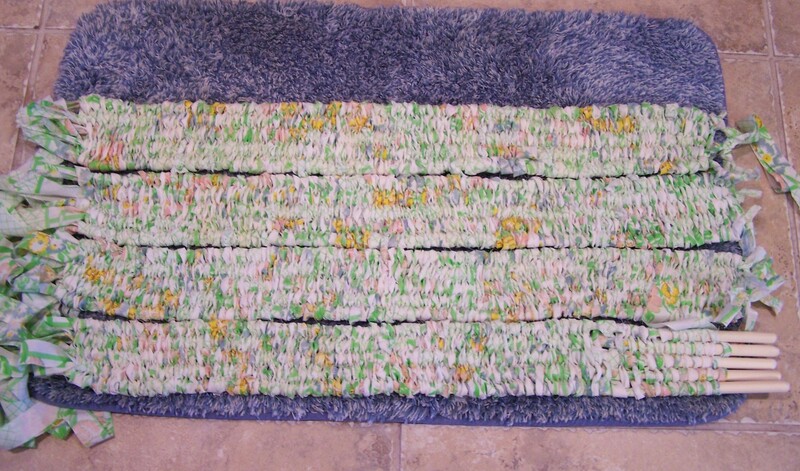 Do you have the next step of putting the fabric rug together? 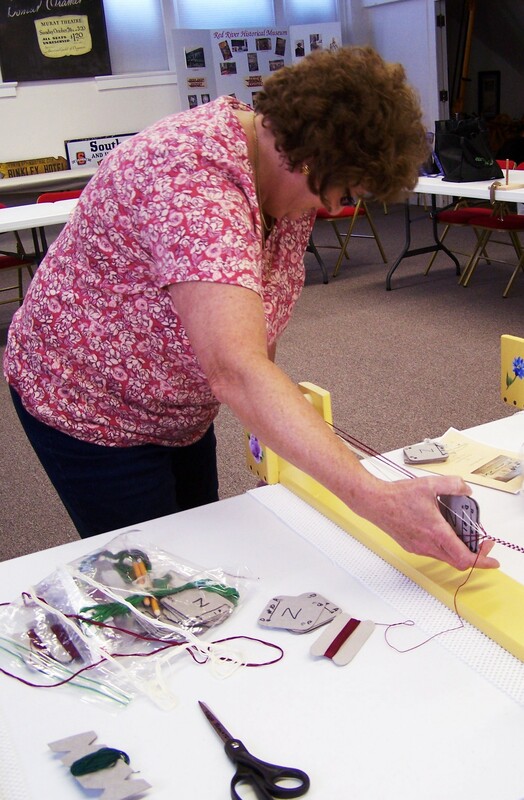 Tablet weaving Class 3? I’m sorry, Melody, I don’t. I actually gave these pieces to a friend of mine who appeared to desperately want them and she did sew them together (using regular sewing thread) along the long edges and uses it for her bathroom rug. I had planned to use a strip of the like fabric and weave the pieces together by slipping the fabric over and under the side stitch of each piece.. in effect weaving them together using fabric strips.